Image caption The record breaking steam locomotive has been restored by engineers in Birmingham. 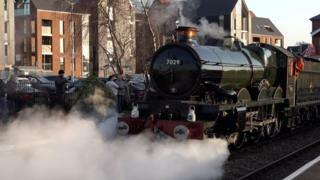 A record-breaking steam locomotive has undertaken a public service on a mainline railway for the first time since 1988. Clun Castle, which at 96mph broke the record for the fastest steam-hauled train between Plymouth and Bristol, was restored by engineers in Birmingham. Passengers travelled from Birmingham through Worcestershire and the Cotswolds to Oxford. The overhaul cost owners Vintage Trains up to £750,000. Clun Castle was built at the former Great Western Railway works at Swindon in May 1950 and broke the steam-haul record in 1964. The locomotive will pull trains to a range of destinations this year, including Chester, Llandudno and Hereford. Cath Bellamy, managing director of Vintage Trains, said: "[We're] pleased to be back on the mainline, with our magnificent flagship engine Clun Castle leading the way following its overhaul at Tyseley Locomotive Works. The locomotive's recommissioning event due large crowds in Birmingham in October 2017. Their trains, including Clun Castle, will operate timetabled services between Birmingham Snow Hill and Stratford-upon-Avon, this summer.